The US Electronic System for Travel Authorization ("ESTA") was implemented in 2009 for visa-exempt nationals who travel to the USA by air or sea. The document must be obtained online prior to departure. You can check if you qualify for the US ESTA by completing our online application. iVisa offers an easy online application process for travelers who need a US ESTA. 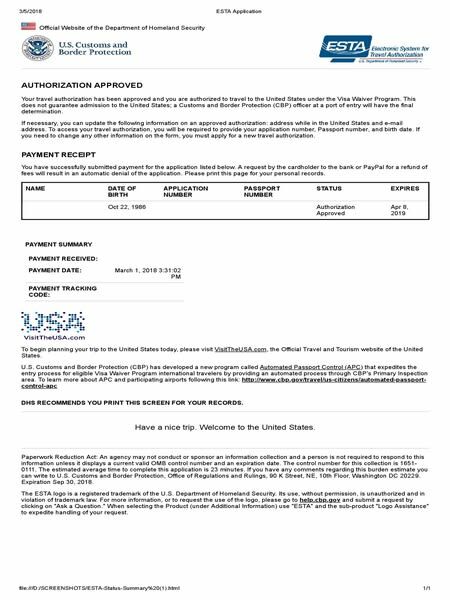 Travelers simply fill out an online application form and the ESTA is delivered via email. We suggest passengers print out and bring a physical copy of the document on their trip. The check-in staff at the airport can verify the ESTA on their system. However, we highly recommend clients to keep a copy of their ESTA on their electronic device or preferably print it out. It is all a very simple process. You are required to apply for ESTA if you intend to enter the United States by air or sea, under the Visa Waiver Program. However, ESTA is not required if you are entering by land. The ESTA is valid for up to two years or until the traveler’s passport expires, whichever comes first. Valid for multiple entries into the U.S. or for multiple connections through the U.S.
Travelers must have their passport with at least 6-month validity from the planned date of entry. If your passport was issued on or after 26th October 2005 it must have a digitally applied photograph. If your ESTA expires while in the US it will not affect your departure. Travelers must obtain a new ESTA authorization if he or she is issued a new passport, or changes his or her name, gender or country of citizenship. What is the US ESTA? What do I need to apply for an ESTA? The passport must be an electronic passport with a digital chip containing bio-metric info. Travelers must have a passport with at least 6-month validity from the planned date of entry. Passport holders must also provide their passport number and Personal Identification Number (PIN). What is the cost to obtain an ESTA? The ESTA cost for the US is 14 USD. Additionally, there is a service fee of 15 USD for standard processing. For Rush and Super Rush processing, the service fee is 45 USD and 65 USD respectively. How long does it take to process an ESTA? How long is the US ESTA valid for? The US ESTA is valid for 2 years after issue. This means you must enter United States within 2 years. It is a multiple entry visa and allows for a maximum stay of 90 days per entry. Yes, accompanied and unaccompanied children (regardless of age) require their own ESTA prior to their travel to the U.S. Children listed on their parents' passport do not qualify for an ESTA. Children must have their own (un-expired) passport in order to qualify for an ESTA. How soon before my arrival should I apply? You should apply at least 3 days before your arrival. However, since the ESTA is valid for 2 years, it is recommended that you apply as soon as you are able. When will I have to re-apply for the US ESTA? The US ESTA approvals will be granted for a period of 2 (two) years or until the applicant's passport expires, whichever comes first. The ESTA will show the applicable validity dates. When must I obtain a visa to travel to the USA? You must get the US Visa at one of their embassies if any of the following conditions apply to you: (1) If you will arrive in the USA aboard an air carrier (by plane). (2) If you will visit the USA for more than 90 days. (3) If you are traveling to the USA for a purpose other than short-term tourism or business. Nationals of VWP countries who are also nationals of Iran, Iraq, Sudan, or Syria are NOT eligible for an ESTA. In addition, nationals of VWP countries who have traveled to or been present in Iran, Iraq, Sudan, Syria, Libya, Somalia and Yemen on or after March 1, 2011 are not eligible for an ESTA. No. If your ESTA is approved, it only states that you are eligible to travel to the United States under the Visa Waiver Program, but does not guarantee that you are admissible to the United States. Upon arrival in the USA, you will be inspected by an Immigration officer who will determine that you are admissible under the Visa Waiver Program and/or any other United States law. The Visa Waiver Program (VWP) is administered by the DHS (Dept. of Homeland Security) and enables eligible citizens or nationals of designated countries to travel to the United States for tourism or business (for stays of up to 90 days) without first obtaining a visa. Individuals who possess a valid visa will still be able to travel to the United States on that visa for the purpose for which it was issued. Individuals traveling on valid visas are not required to apply for an ESTA. No, you do not have to have a confirmed travel itinerary (flights or otherwise) prior to applying. What is the maximum number of days I can stay in the US with the ESTA? The maximum stay is 90 days per entry. The ESTA is valid for 2 years from issue (or when your passport expires, whichever occurs first) and allows you multiple entries during its validity period. However, each entry cannot exceed 90 days. What happens if my ESTA expires after I arrive in the U.S.? Will it affect my departure? No. If your ESTA expires after you arrive in the U.S., it will not affect your departure. However, once you have departed you will need to renew your ESTA in order to re-enter the U.S.
Every nation around the world has heard about the American Dream, right? The US is the land of opportunity, and dogs walk around with bagel around their tails. While that is not entirely true, you cannot miss the chance to visit the States. There are good and bad things, just like anywhere else in the world, but the main thing you should remember is that a trip to the US can be a life-changing experience. Here is what you should know about the United States before you take a trip there. First of all, you cannot grasp just how huge the United States is. To get a clear picture, a flight from New York to LA lasts just as much as one from New York to London. Is that clear enough for you? The United States cover a continent from one coast to the other, so it makes sense that is big, right? While that may not affect you, you should probably be aware that you cannot explore many of the states in just one vacation. Just make an itinerary of the things that you would like to see, and take it from there. Something that will have a significant impact on you is the number of people. There are a lot of them, and big cities are usually packed. Plus, and you are going to like this one, there are so many cultures in just one country that it will make your head spin. You can find people of all races, religions, and different whatever you can think of. You could say that the United States is a melting pot of different cultures, but that is one of its beauties. Needless to say, you need to show respect for each and single culture you come across to. Otherwise, your trip will not be as pleasant as expected. While most of the countries in the world have the metric system, the United States still have the imperial system. I am saying ‘still’ because a lot of people would want to go from imperial to metric. It makes more sense for most people. Plus, they have names for every measurement which can be a hella confusing for foreigner used to the metric system. Do you want a gallon of milk or just a few ounces? Who knows? Only the American do. Another thing that will probably baffle you is shopping. Not because you may have difficulties in choosing from the vast variety of products, but because the price on the shelf and the total you need to pay at check-out are different. Why? Because the prices tag at the shelf does not contain tax. At all. The cashier adds the tax when you want to leave. So make sure that you have more money than you think you need before going to a grocery store. Tipping, while it is voluntary in theory, is more of a must. That is because waiters work on a minimum wage, and they depend on your tip to make a good living. It seems a bit backward, to be honest, but that is the practice in the United States. As if that were not enough, tipping is considerably generous. It needs to be somewhere between 15% and 20% of the total amount you need to pay. The worst part about this is that some tourists declared that they were harassed because they tipped too little. That is not a general rule, but if there is a bad time to be a cheapskate, this is it. You may be a bit overwhelmed if you visit the big cities in the United States. For example, New York is an enormous city, and while you cannot get lost thanks to the mighty internet, it will be a little too much. Especially if you are not used to metropolitan areas. There are a lot of people everywhere at any given time. New York is not called the city that never sleeps for no reason. One of the things that you will love about the United States is that you can find places open 24/7 almost everywhere. Do you want Thai food at 5 AM in the morning? No problem. There are probably a dozen such places open at that hour. You can get everything anytime, which is one of the aspects that foreigners usually love. Another aspect that tourists appreciate in the United States is the food. As you can imagine, the best restaurants in the world are in the US. New York and San Francisco have a lot of restaurants that have Michelin stars, which we all know that it is not nothing. Of course, you need to afford to eat at one of those restaurants, but if you do, you should definitely try it. Famous chefs cook there, and the food is heavenly. Speaking of food, the Americans eat a lot of beef. They do eat chicken and pork as well, but the beef is the primary meat in consumption. That is one of the reasons why Montana has three times more cows than people. Even so, you find a vast variety of dishes that contain rare beef, and you should try it at least once. Lastly, you should know that people in the United States are generally nice and welcoming. Some things will come off as cold, like the way they say goodbye or the fact that they hang up the phone without saying goodbye, but they are sociable and friendly. They are always curious about new people, and chances are that they will make you feel at home. The bottom line is that you can find pretty much whatever you want in the United States. You should also explore nature while there because the United States has the most beautiful national parks in the world. Do not limit yourself to urban areas. Other than that, you will enjoy your experience there, and you will probably want to come back to check out the parts that are not a part of your initial itinerary.